53rd Arty Brigade HQ	 Maxwell AFB, Montgomery, AL .
.	 Wlas, John, Spec. 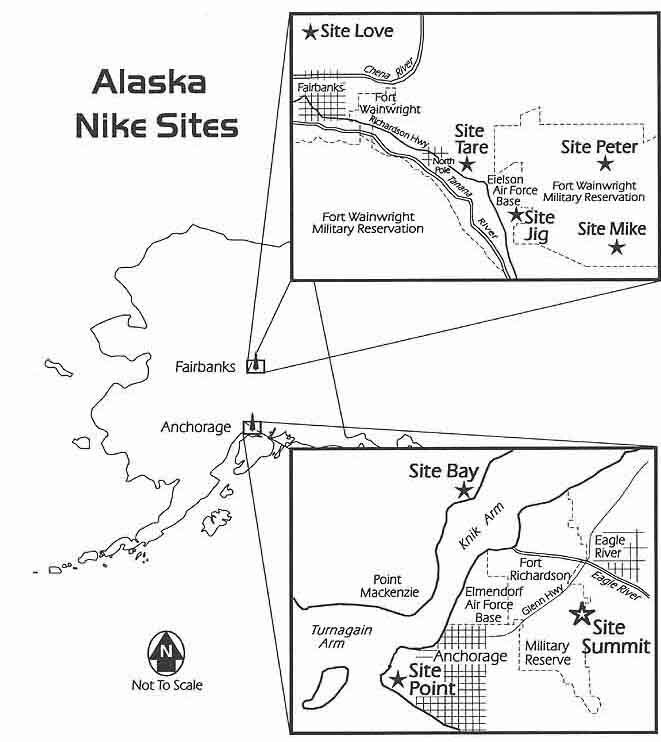 4 Technical Illustrator.....mapping the Brigades sites in the SE, U.S.
Roger A Babler, webmaster for a-2-562 “Moose Creek Nike”, sent out a mass e-mailing to Alaska Nike folks listed here, and shared his "Email Bounces" data. .
166 Ord Co	 Ft. Wainwright, - NW Fairbanks . HQ 2/262 ADA, S3 shop,	 Ft. Wainwright, - NW Fairbanks . 2d Bn 562 Arty Eielson AFB - B/2/562d	 .
.	 Clarke, Bill, I was stationed at B Battery 2-562nd in Alaska from 1964 to 1965. I was there for the Good Friday Earthquake. Mainly I am emailing regarding the locations shown for Site Peter (B Battery) on Google Earth. The Launch area is correctly spotted (hard to miss the scars on the hilltop) but the IFC is not where it actually was. In fact the IFC was about 1km as the crow flies southeast on the south side of the road you see in Google Earth. dialog here Also I (as a Lt) drove by the Launch area every day coming up the hill from Eielson AFB where I was quartered. This was one of the sites from which we launched missiles at naive Navy pilots. Hopper, Steven T., E1, 2 & 3 Missle Crewman (16B20). So isolated, few ever made it into Fairbanks or even Wainwright unless passing thru on leave. Most memorable duties were back of low-boy semi trk trailer and picking up and dumping emergency toilets from all around Wainwright, still affected by the big one). But the TDY duty recovering equipment from emergency evacuated chem warfare camp (some hrs north by chopper) was interesting too. A dozen of us left there for about 2 weeks in two tents, one C-130 dropped APC and wolves baying nightly just out of M-14 range. My P-Pong serve was so deadly, guys tried claiming it was illegal. Chris Bryant, my close friend there. Also, I've searched in vane for over forty years trying to replace my lost insignia pin. The only picture of it I can find, does no justice to it's actual beauty. C/2/562	 Fairbanks, 10 SE Eielson AFB - C/2/562d . D/2/562	 Fairbanks, 5 S Eielson AFB - D/2/562d	 . A/2/562	 Fairbanks, 20 S Nenana - A/2/562d - "Moose Creek"? 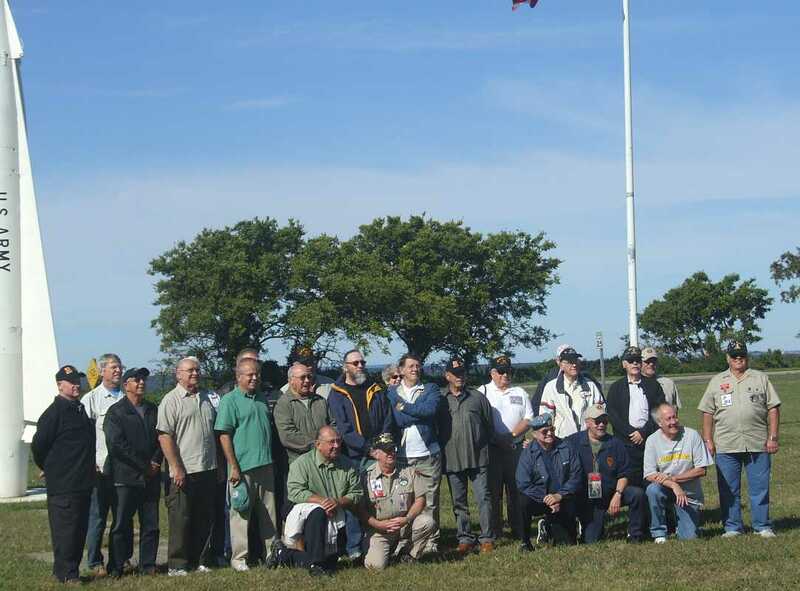 Reunions yearly open to all Fairbanks / Eielson Nike Vets - Contact Roger Babler or Paul Kulba with your E Mail web site .
.	 Kulba, Paul A., I Have many fond memories. Would love to hear from anyone. E/2/562	 10 NW Fairbanks - E/2/562d	 . AADCP	 in Anchorage, John Woods said "... far side of the Airport". - via . 4th Bn, 43rd ADA	 in Anchorage, Fort Richardson .
.	 Butler, Jim, Fantastic tour up there, planing on going back in 2010...amazed I found this site. - 29 Orchard St. Upton, Ma. 01568 ..
A 4/43 10 SW Anchorage	- (Airport) . C 4/43rd 20 NW Anchorage (Goose Bay)	 . The latest on the Lets waste our money blowing up Summit March 2008 . 524 Ord Co (GMDS) FT. Richardson, Anchorage . Murphy Dome about 40 miles north west of Fairbanks, Alaska	 .